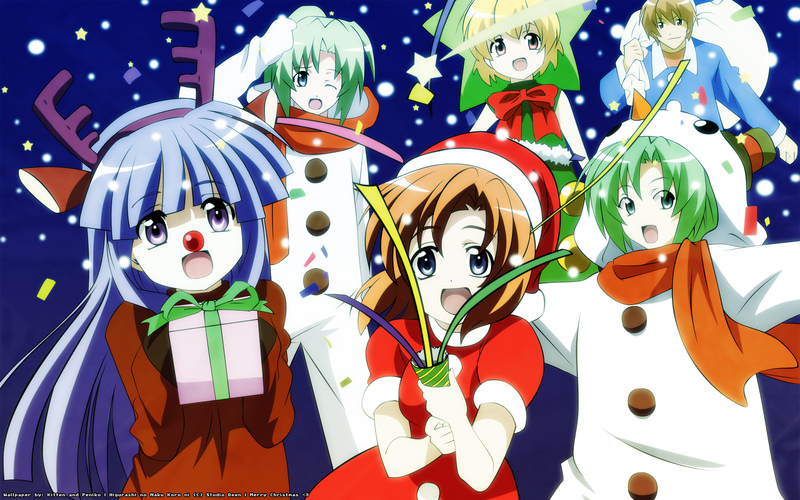 Higurashi no Naku Koro ni Wallpaper: Celebrate the good times! Minitokyo »	Higurashi no Naku Koro ni Wallpapers » Higurashi no Naku Koro ni Wallpaper: Celebrate the good times! she finished vector I wasn't sure of what bg to give it. messy thing so I thought the usual was ok.
used textures to put it all together. exciting and bright, since it's all "happy" and stuff. Browse Higurashi no Naku Koro ni Gallery: Recent | Popular. The boy in the back is Keiichi. really loves it..gotta set it to my desktop bg! Everything about this great scan Screams out merry christmas. So Happy holidays to you all and "GOD bless you all." Well, ain't that the pinnacle of Christmas spirit. Kudos. We like to see seasonal walls. As usual, nice job Kitten. Good vectoring, Peniko. An awesome vector ! Your vectoring skills really have improved A LOT! I like the Christmas theme, and the fact that it's a bright, hopeful image. Thanks for posting & look forward to more of your work!